Ever since I set foot in Bangkok back in the 1980s, dealing with Thai banks has always been a source of frustration. Thai banks do subscribe to the various international conventions generated by the BIS, ICC and IMF, and even Thai banking laws very much mirror those of Western countries. However, Thai banks do still seem to do things a bit differently at times, and this tends to be the source of frustration. However, if you feel frustrated with banks in Thailand today, I can confirm it was significantly worse 30 years ago, when it could take a month for an international transfer to arrive, and where you had to go to your banks head office for all matters other than simple transactions (and where you could be waiting around in lines all day or worse). My article today is intended to help those who have recently arrived in Bangkok, either for work, study, retirement or an extended stay, and who haven’t figured out the local banking system yet. For those that have been here a while already, there may be some little tricks I have picked up that you weren’t aware of. I won’t recommend any particular bank because I have not tried all of them, and in fact, for most of my 30 years in Thailand I have been loyal to a single bank and only tried out one other bank (and decided to stick with my original bank). There are differences between Thai banks, and I tend to have a preference for sticking with those that seem most likely to survive a financial, economic or political crisis. Bangkok Bank, Siam Commercial Bank and Kasikorn (aka Thai Farmers) Bank should all be reasonably safe bets. When you decide to open an account, please note that your choice of account depends very much on what type of visa you are on. If you are only on short term visas, then you can only open a savings account (without on-line banking access), with a debit card for standard ATM transactions, plus a passbook for over-the-counter transactions. If you can provide evidence of a longer term stay, such as a one year visa, work permit, registration on house papers, retirement visa, marriage visa or similar, then you have more options, including on-line banking access, cheque accounts, local credit cards and access to electronic on-line international funds transfer facilities. Therefore, bring as much supporting documentation as you can. Thai banks are very procedural and procedures tend to be followed quite strictly, irrespective of whether the procedure has become out-dated. For example, when I updated some details on my savings account, the bank officer asked to see my passport. I gave her my current passport, but this wasn’t sufficient. She needed to see the passport that I had used back in 2001 when I originally opened that particular account, because that was the passport number they had on file. She even wanted me to go home and retrieve that passport. It was only after the bank manager became involved that they agreed to dispense with that requirement. A current passport, showing your entry permit (and visa if applicable). If you require more than a standard savings account (without online access), you will also need to supply further evidence of your entitlement to long-term stay in Thailand. For those on work visas, you need to bring the work permit. For those on retirement visas, you need proof that you meet the income threshold, such as a letter from your embassy confirming your pension (this will be the same documentation you require for immigration to obtain your visa/extension in the first place). For those on student visas, you need proof of enrolment. Note that student visas are becoming more short term now (e.g. only 3 month or 6 month stays before the visa holder needs to exit the country and renew their visa) and it is unclear how banks will react to that. Also for those on long stay visas, bring a document that shows proof of address and residency in Thailand such as a utilities bill with your name and Bangkok address on it, or a Tabien Baan (or house book; the yellow book obtained from your local municipal office) that shows you are registered as living at that address. In the old days, it was prudent for a foreigner to go to the head branch of the applicable bank to open up their account. Those days are long over, and instead go to the bank closest to your place of residence. If you live outside of Bangkok, then open up an account in your province. This is important because ATM withdrawals made in provinces outside of your branch incur an ATM fee. When opening an account, if you meet all the requirements, but still have problems, my suggestion is try a different branch. Sometimes you just get unlucky and end up with someone who doesn’t really understand the rules, or doesn’t like you and therefore makes up additional hoops for you to jump through. You can also ask to talk to their manager, but making a scene is rarely going to resolve the issue (trust me, my dad used to yell at the bank staff, and it took his international money transfers up to 30 days to arrive in his Thai account). Before you open up an account, make sure you get a good handle on the bank fees that apply to your particular account. For example, with a standard savings account, you get a standard debit card for ATM withdrawals. However, if you choose to upgrade to the smart card, this will cost you extra, either (or both) via an up-front card fee (e.g. 300 baht) and/or an increase in your annual service fee. Also take note that you do incur bank fees on the account (which I understand also includes a government charge; mine seems to be an annual fee of 200 baht), but I have found these to be quite minimal and the interest (even though rates are low) means that the money does appreciate each year. Note also the terms relating to fees for different types of transactions. Transferring money from your account to another account within the same bank is usually fee free. However, transferring to a competing bank usually incurs a fee (around 25 baht per transaction). 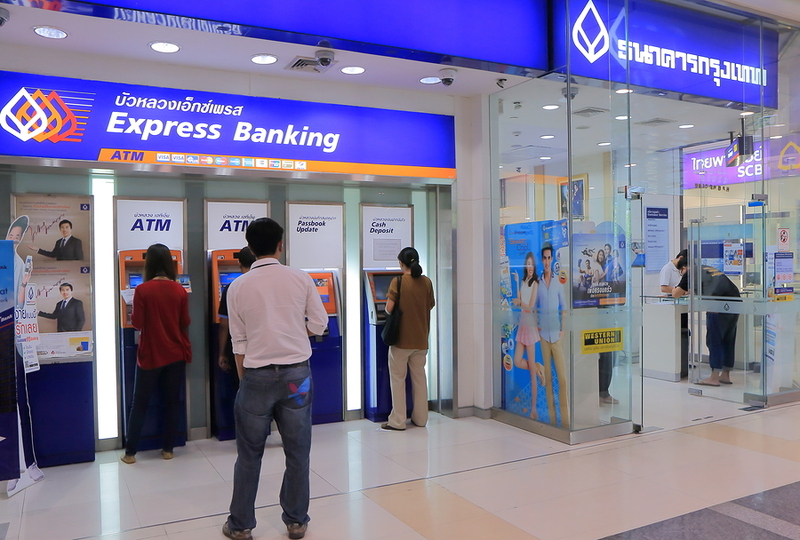 Withdrawing in person at a branch can also incur a fee (around 10 baht per transaction). As I mentioned earlier, withdrawing from an ATM in a different province to your branch can also incur a fee (even though it is the same bank), this seems to be around 15 to 20 baht these days. Because of bank fees in Thailand, most employers request that their employees open up an account with the same bank as the employer for payment of salary. This is because the employer does not want to waste money on transfer fees. This is one of those things you just need to learn to live with. I discuss foreign transaction fees in the next section. There are some real tricks to following the right steps with foreign currency transactions to get you the best overall rate/low fee combination when you transfer funds into or out of Thailand. Most tourists use their credit card in Thai ATMs and are then charged a 180 baht transaction fee (150 baht on AEON ATMs), plus the exchange is done at the foreign bank/credit company exchange rate, and the credit card’s international transaction fee (e.g. 3.5% of the transaction amount). A trick for this type of transaction is instead of using an ATM, try going into a bank branch and making the withdrawal there. You may be able to escape the 180 baht fee and instead only be charged the branch fee (often 10 baht). For those with Thai bank accounts, when you transfer money from overseas, the fees can be different depending on currency and location of the foreign bank. In most cases, the fees are around 0.25% of the transfer amount, with a minimum fee of 200 baht and maximum fee of 500 baht. In addition, the sending bank will also charge its international transaction fee (which I have generally found to be more than the fees charged by Thai banks). Unlike credit card transactions, the exchange rates used by foreign banks on foreign currency transfers between banks are usually pretty poor. Therefore it is usually in your best interest to request that your foreign bank transfers the money unconverted (e.g. if sending from the US, send as US dollars. Don’t let your US bank convert it to Thai baht because they will give you a poor exchange rate). Let the Thai bank do the conversion. They give fairly good rates and do not charge any commission or fee other than the foreign transfer fee mentioned above (200 to 500 baht). If you really want to save on bank fees, then walk the money over yourself on your next plane trip (just keep in mind the obligations regarding declaring large amounts of cash… failure to declare could result in you forfeiting that cash). For absolute best results, take that cash to one of the better money lenders such as Super Rich (across Ratchadamri road from Central World), then deposit the Thai baht at your nearest bank branch, without incurring any bank fees whatsoever. This is not always convenient, and not really practical for large sums. However, it is really the small transactions where the transaction fees have a big sting. For those that are looking to invest in Thailand, the banks offer a specific foreign investment fund account that complies with Thai investment laws (e.g. for purchase of property; where evidence of transfer of funds from overseas is required). You do not need to have any sort of long stay visa to open such an account. However, you also do not have ATM nor internet banking access to the account. You must physically go into a branch to withdraw money. If the investment is for a one-off, then that seems to be the way to go (although be very cautious about granting anyone power of attorney to withdraw the money on your behalf… even lawyers have been known to disappear with the money). To keep things simple and smooth, go to the branch where you opened your account. They will have hard copies of the paperwork. Notwithstanding the digital age, Thai banks do still seem to prefer hard copies. I had nothing but headaches when I went to a different branch and tried to change my residential address. Although Thai banking laws do require banks to compensate victims for money stolen from their accounts, Thai banks will put up a big fight before they compensate you. Unless you have really strong evidence that you did not in any way contribute to the theft (including that you gave the bank prompt notice to cancel cards etc. and you had taken all proper precautions with respect to passwords, locking up your documents etc.) you are unlikely to be successful in recovering money if an unauthorised person manages to gain access to your account. If you think your account has been compromised, I recommend you not only cancel your ATM cards etc, but actually close down that particular account and open a new one. I recall a story I read in the Bangkok Post or the Nation newspaper about a person who had a card stolen, cancelled it, and when she received her new card, it kept the original card number so that the thief was still able to withdraw funds from her account. Therefore, I strongly recommend that you keep only enough money in Thailand for regular spending and to meet any long stay requirements, but keep your investment money elsewhere (the interest rates aren’t that great in Thailand anyway). If the worst happened, you have better protection and government guarantees in most Western countries.